We'll start out easy - Tournesol is a cute little French bistro right across the river in Long Island City. 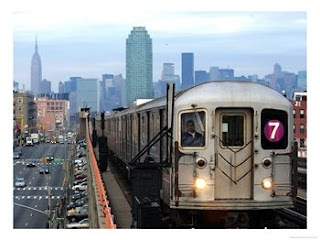 For those in midtown east, it's probably closer to you than most other parts of Manhattan - just hop on the 7 train and get off at the first stop in Queens. The menu features a solid steak frites, foie gras terrine and an excellent skate wing, among other things - plus, they run many time-tested bistro classics as their "plats du jour" - coq au vin, cassoulet, bouillabaisse, etc. The place is friendly but tiny, so make a reservation ahead of time. Honestly, you can find cute little bistros elsewhere, but this is ours and it's a good one. This takes us further out into Woodside, where underneath the 7 platform at Roosevelt Ave. and 51st street lies La Flor - unassuming on the outside, but featuring absolutely delicious authentic and upscale mexican cooking with a smattering of French and fusion-type dishes. The brunch is a local favorite, and one of the best in Queens, but the place serves great food throughout the day, and features musicians on some evenings. They do great things with eggs here at brunch (think huevos rancheros, and variations thereof), and they serve a hearty and delicious quesadilla which features a thick homemade corn tortilla and is quite unlike other quesadillas. As far as I can tell, they do everything well here, so check it out. Further up Roosevelt Avenue in the heart of Woodside is Donovan's, a classic Irish pub that also happens to feature one of the best burgers in Manhattan. I make no claim that this is THE best burger (an invitation to a fistfight, or at least an impassioned debate), but it is damn good -a large, meaty, juicy hunk of meat that will not disappoint fans of serious burgers. Also, I should add that it is ranked number 2 in NYC in the "burger rankings" at Burger of The Month. The pub is very charming and a good place to enjoy a Guinness, a burger and some good company. I haven't eaten any of the other food there so I can't comment, but the burger is the big draw. It is right off the Woodside express stop on the 7, which is a quick ride out from Grand Central, so about as convenient as Queens gets. Yet another Woodside entry at 39th Ave. and 64th St., what can I say about this place that hasn't already been said? Consistently the #1 NY thai restaurant in the Zagat's survey, Sripraphai packs 'em in and serves up delicious, authentic and spicy thai dishes. It boasts a giant menu with something for just about everybody, and is very inexpensive (it should be noted that the atmosphere is clean and efficient but very much "no frills," so despite its high Zagat rating, don't expect fine dining). It is well worth a trip to Queens just to go here, but I recommend going at off hours if you are attempting a weekend dinner - that is to say, go early before the rush. The place does not take reservations and people spill out on to the street waiting for tables on a saturday night. I particularly enjoy their crispy watercress salad and the fried whole snapper in curry sauce, but just about everything is worth trying. I recommend you go with a lot of people and get a lot of dishes to share. Also, please don't just order the pad thai. It's good, but there is a whole universe out there, you know? Astoria is a big-time food destination and is renowned for its Greek restaurants. One that I have particularly enjoyed is Taverna Kyclades, which is located way up Ditmars Blvd. at 33rd Street. This place is very popular and the crowds can be daunting - again, it is best to try going at off hours and even then you will probably wait a little while. But don't let the crowds put you off, the seafood here is absolutely delicious, you can't really go wrong. Again, it is well worth the trip just to eat here, and there are plenty of other things to do in Astoria so you can make an afternoon out of it. As with most restaurants in Queens, this is not a fine dining experience, so don't expect them to roll out the red carpet for you. Also, their website is very unassuming but don't be mislead - you will have a damn good meal and it won't be anywhere near as expensive as what you would pay for similar quality food in Manhattan. Kabab Cafe is a tiny Egyptian restaurant way up Steinway Avenue in Astoria, with only a few tables and no enclosed kitchen. All meals are prepared by Ali himself, with the help of one or two assistants, about five feet from where you are sitting. There is no fixed menu, you choose from whatever Ali is cooking that particular day. The best way to experience it is to put yourself in Ali's hands and eat what he feels like making - which includes some of the most delicious falafel and hummus I have ever tasted, as well as a wide assortment of other outstanding Egyptian dishes. However- if you do this, you will very likely be eating adventurously - Ali regularly serves up brains, sweetbreads, "rocky mountain oysters" and various other organs. So don't be squeamish. I found my meal here to be a great experience, but it is not for everyone, and it is not cheap. Basically, it's like eating in Ali's kitchen, with him at the stove. If this sounds appealing to you, check it out for sure - but again, choose your dining time strategically - a restaurant with four tables fills up pretty quick. On the other hand, if you like spacious digs, insist on choosing your selections off a menu and have a low tolerance for offal or North African flavors, then you may be better off elsewhere. So, our tour moves even further out to Jackson Heights. This neighborhood is super-bustling, sort of the crossroads of Queens and possibly the most ethnically diverse zip code in the country. Within about ten square blocks you can find numerous restaurants and shops run by Indians, Peruvians, Thai, Colombians, Malaysians, Mexicans, Ecuadorians and others. There is a lot to eat here and an entire blog could doubtless be devoted to it. With all due respect to the numerous fine restaurants in this neighborhood, I am focusing on a particular favorite of mine, a small and unassuming but delicious thai restaurant on 79th Street off of Roosevelt Avenue called Arunee. This place boasts excellent and authentic thai food that is right up there with what Sripraphai has to offer. Although it seems likely that visitors to Queens will head to Sripraphai, I am adding Arunee here because it used to be my neighborhood thai joint and I have fond memories. Honestly, it is worth coming out to Arunee for the simple reason that Manhattan 's thai options are generally uninspiring and this will be a like a breath of fresh air in comparison. Likewise, if Sripraphai is a madhouse, just take the 7 train two more stops up to 82nd, walk down a couple of blocks and you're there. They do a great veggie curry here, for you vegetarians - unlike the sad offerings at a lot of other places, they load it up with a variety of different hearty veggies and tofu. No culinary tour of Queens would be complete without a visit to Flushing for some Chinese food. Spicy & Tasty is located at 39-07 Prince St. off the Flushing/Main Street stop on the 7 (the end of the line). As the name would suggest, it serves seriously spicy and delicious sichuan food. It is not for the faint of heart, so if you do not like spicy foods, you may wish to skip this one. At the front of the restaurant is a refrigerator case stocked with the restaurant's cold dishes. The procedure is, you order whatever cold dishes you want up front, then they take you back to your table and the cold dishes are served quite quickly thereafter. During that time you decide what hot dishes you are going to order. One approach is to peek around at what the Chinese patrons nearby have ordered, and then order that - of course, you have to be willing to be adventurous if you do this. I've really enjoyed this place, but there are of course many different restaurants in this neighborhood, many of which are undoubtably excellent, so it is worth exploring. But if you like Sichuan cooking particularly, this is probably a good bet. Also, for you Mets fans, it is very convenient to Shea Stadium if you are hungry after the game. One word of advice is that you should Google or Mapquest it carefully before showing up, Flushing can be a little hectic and confusing once you get off the 7 train. These are not the only reasons to come out Queens to eat, but they comprise many of the top foodie destinations. There are a few places I still have not gotten to, such as Spicy Mina's (apparently the Bangladeshi answer to Ali's Kebab Cafe), and Zumm Stammtisch, a Bavarian restaurant in Glendale that looks like a good time. And there are undoubtably others that I have not yet discovered. So don't be afraid to come out to Queens, and don't turn up your nose - there's a lot to like out here.